What kind of "privacy" do we have, in a time in which new technologies increasingly send detailed information about everything we are doing to private companies, which then provide that information about us to the government? In the case of Smith v. Maryland, decided on June 20, 1979, the United States Supreme Court held that the police did not need to obtain a search warrant to install a "pen register" on a telephone owned by Michael Lee Smith. Using the pen register, the police were able to collect information about calls made from Smith's phone, including the telephone numbers called, and the date and time of all calls made. Evidence about the calls made from Smith's telephone was provided to the police by the telephone company, and was used to convict Smith of robbery. Smith argued that the police should have gotten a search warrant, based on probable cause, before using the pen register. He wanted the evidence collected by the pen register suppressed. The Supreme Court reasoned that Smith had no "expectation of privacy," since Smith well knew that the phone company was recording all the information associated with the calls he made from the phone. There was nothing "private" about that! In 2013, Edward Snowden revealed that the United States government was obtaining exactly the same kind of information the police had collected in the Smith case, but was collecting this information about EVERYONE'S phone calls, and was retaining all these records in a giant database, essentially forever. A federal trial court judge, William Pauley, said that the Smith case controlled, and that there was nothing wrong with the practices that Snowden revealed. According to Pauley's decision in American Civil Liberties Union v. James R. Clapper, no one in the country has any "expectation of privacy" about the kind of "metadata" that the government has been collecting, since anyone using a telephone understands that the information collected by the government is being recorded and retained by their telephone service provider. It's not really, "private" if the telephone company has it! Judge Richard Leon, another federal trial court judge, came to an exactly opposite conclusion in a case called Klayman v. Obama, decided at virtually the same time as the Clapper case. Judge Leon reasoned that United States v. Jones, a case decided in January 2012, pretty much overruled Smith. 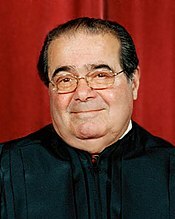 The decision in the Jones case was unanimous, and was written by Justice Antonin Scalia, pictured above. Scalia, who died in 2016, was one of the Court's more conservative members. The Jones case was not a case about telephones; it was about the use of a GPS tracking device, which the police had placed on Jones' automobile. Expectations about privacy, however, was at the heart of the Jones case. Using the GPS information they gathered from the device, the police were able to track Jones' whereabouts over an extended period of time, and they used the information to convict him. Scalia's opinion pointed out that new technologies dramatically increase the ability of the government to surveil the citizenry, so that the old rules have to be reevaluated. Consider the case of Carpenter v. United States. The Supreme Court of the United States Blog (SCOTUS Blog) describes the Carpenter case as follows: "Issue: Whether the warrantless seizure and search of historical cellphone records revealing the location and movements of a cellphone user over the course of 127 days is permitted by the Fourth Amendment." The Carpenter case was argued on November 29, 2017, so a decision can be expected by June of this year. Check out the arguments. I'm hoping that the Supreme Court is going to decide that our government is simply not allowed to spy on me unless the government can convince a judge that there is some reasonable, probable cause to think I've done something wrong. I wouldn't be a bit surprised if you, dear reader, feel just the same!